Would you like to join and register to EU-Cardio? Acute myocardial infarction (AMI) and the heart failure (HF) that often follows are the leading causes of death and disability in Europe and worldwide. As such, new treatment strategies are needed to protect the heart against acute ischemia/reperfusion injury (IRI) in order to preserve cardiac function and prevent adverse left ventricular remodeling and HF – a strategy termed “cardioprotection.” Despite intensive experimental and clinical research since the discovery of the remarkable cardioprotective effect of ischemic preconditioning more than 3 decades ago, there are currently no effective cardioprotective therapies in clinical practice. The challenge has been to successfully translate novel cardioprotective therapies discovered in experimental studies into the clinical setting for patient benefit. This EU-CARDIOPROTECTION COST Action CA16225 will address this challenge by setting up a pan-European research network of leading experts in experimental and clinical cardioprotection, to jointly develop innovative strategies for translating novel cardioprotective therapies into the clinical setting. This will be achieved through 4 main research objectives, each linked to the activities of a Working Group (WG): (1) WG1 New Targets: to use innovative strategies to discover novel targets for cardioprotection, given that many of the established cardioprotective targets have so far failed; (2) WG2 Combination Therapy: to investigate the effects of using combination therapy directed to multiple targets as an innovative cardioprotective strategy, given that single-targeted approaches to cardioprotection have so far failed; (3) WG3 Confounders: to use more clinically relevant animal AMI/HF models for testing novel cardioprotective therapies which take into account the confounding effects of co-morbidities and co-medications, given that many of the failed clinical studies have been based on therapies developed using juvenile healthy animal models; and (4) WG4 Consortium: to set up a European network of research centers (called the European Cardioprotection Consortium (ECC)) for multi-center randomized placebo-controlled testing of novel cardioprotective therapies in small/large animal AMI/HF models, and in AMI/HF patients, in order to improve the rigor of pre-clinical and clinical testing of novel cardioprotective therapies. 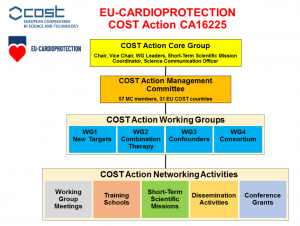 In summary, the overall objective of the EU-CARDIOPROTECTION COST Action CA16225 will be to improve the translation of novel cardioprotective therapies into the clinical setting for patient benefit.